We carry Longbottom coffee because they are local, roasting in Hillsboro and because they believe in supporting organizations like coffee kids: a non-profit organization who’s mission is to provide coffee communities with the resources they need to become healthy and educated so that they may thrive. We use a Chemex Pour-Over for our single cups of coffee. The Chemex provides a rich, smooth and non-bitter cup of coffee that is incredible! We also have the most beautiful pour-over station in the city (in my opinion). 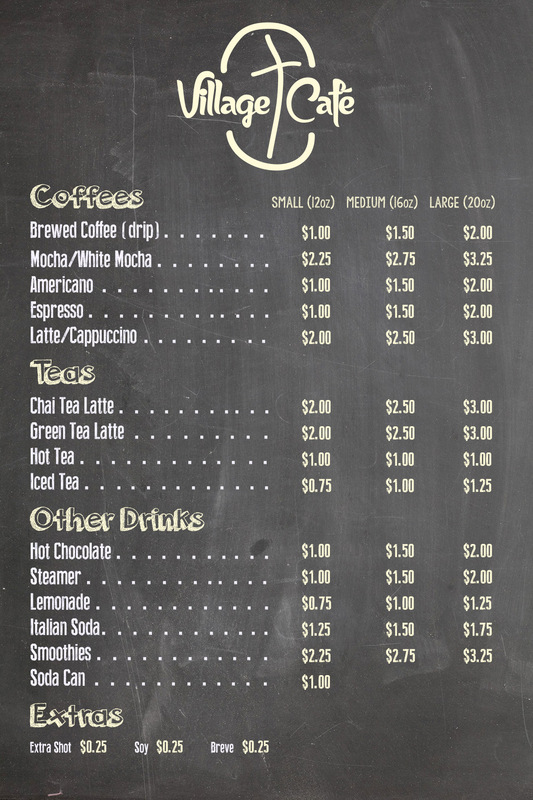 Click here to view our Café menu. Our business is very fluid. If you support our cafe but would like to see something added to our menu, let us know and we will come up with a recipe. Village Cafe is an extension of Village’s focus to impact our community in a positive way. Our cafe is marked by love; So our desire is for everyone who enters to feel welcome and comfortable. Sit in a cushy chair and relax in front of the fire (when it’s cold) while sipping a quality beverage. Our doors are always open and in the future we would love to be able to offer cafe services throughout the day. We are utilizing our relationships with other non-profit groups to grow our cafe service in order to provide quality product and quality service in a quality environment. Sign-up for our email newsletter!